Dry fruits have been known for their health boosting capabilities. You can gift delicious temptations and good health to your loved ones. Our range of almonds, pistachios, raisins, cashew nuts etc. are of the highest quality. 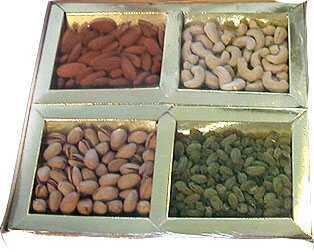 Dry Fruits: Kaju, Badam, Kishmish & Pista packed in an attractice box. Gift these dry fruits for the festival. RAISINS(KISHMISH): Raisins(Kishmish)(800gms gift pack) .